On the Farm - Let's Talk Turkey! Despite the many legends surrounding the arrival of Franklin, the school’s unofficial mascot, the true story is that he was incubated and hand-raised by a local veterinarian and neighbor who then gave him to us after a fox took his mate. 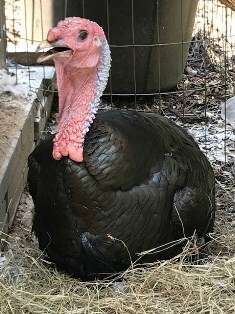 Franklin, a Heritage Bronze turkey, who has been with us for a little over two years now loves to eat all kinds of fruit and greens. His daily diet consists mostly of corn, bird seed and chicken feed. His care is handled by Upper Elementary students who ensure he has fresh water and food every day. At some point, we will try to get him another mate, and they will return to the inner paddock where they have a ready-made turkey hotel. Franklin loves the company of people, especially the Primary children who, perhaps because they are about his height and wear bright colors, seem to fascinate him. He likes to walk with them on their way to carpool and gets a little panicked if he misses the parade; sometimes, he’ll even fly to catch up to them! (Did you know wild turkeys can run up to 25 mph and fly up to 55 mph?) Though his size may be a bit intimidating, he is simply a curious bird who loves a snack; if he thinks you have food, he will follow you everywhere! If this makes you uncomfortable, just remember you are bigger than he is and standing and facing him makes him lose interest and wander away. Wild turkeys were hunted almost to extinction in the 1900s, but restoration programs have successfully reversed their endangered status. An adult gobbler weighs 16-22 pounds on average and has a beard of modified feathers on his breast that can reach up to 7 inches long. Hens are smaller, weighing 8-12 pounds, and have no beards. Both genders have a snood (the dangly appendage on the face), wattle (the red dangly bit under the chin) and barely any feathers on their heads. Wattles and snoods change color with emotion and their 5500 feathers vary in shape and size depending upon their purpose. The males’ 18 tail feathers are for displaying to their mates! Feathers are completely waterproof, and the soft down feathers underneath their big feathers keep them well-insulated from the cold. Feel free to stop by and remind Franklin that he is a lucky, forever pardoned, bird!